CHAVEZ JR. SCORES IMPRESSIVE 5TH ROUND TKO OVER MANFREDO JR. In a fight that turned out far better than some may have expected, undefeated WBC middleweight champion Julio Cesar Chavez Jr. defeated Peter Manfredo Jr., scoring a 5th round TKO victory to retain his title. 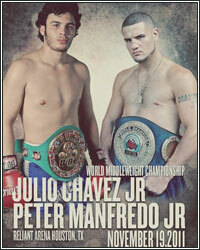 Manfredo was game, taking the fight right to Chavez Jr. Surprising many, however, Chavez Jr. did an excellent job of technically outboxing Manfredo, working behind his jab as he moved around the ring and landed his shots from the outside. As the fight progressed, Manfredo tried to turn up the heat and had some success in the 4th round, but it was clear that the bigger Chavez Jr. was landing the harder shots. That fact would be realized in the 5th round when Chavez Jr. landed a big right hand upstairs that rocked Manfredo and backed him up to the ropes. Chavez Jr. continued to let his hands go as Manfredo did his best to avoid the incoming barrage. After a few more follow-up shots landed from Chavez Jr., the referee had seen enough and called a halt to the action at 1:52 of round 5. Middleweight king Sergio Martinez was in attendance for the bout. When asked who he wanted to face next, Chavez Jr. replied, "I want to fight the best. Sergio Martinez is a great champ. Canelo would be a great fight for the Mexican public, but it all depends on what my promoter says. I fear no one."